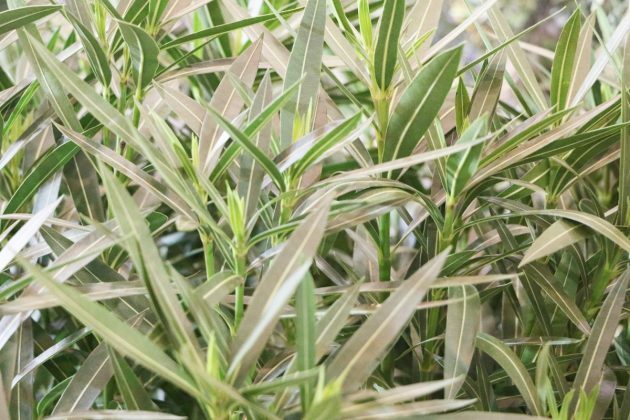 The oleander plant originates in the warmer realms, like the Mediterranean area, that’s why we advise you to cultivate this Mediterranean plant in a pot. By now, there are many different oleander varieties in trade, and the blossom’s colour is not the only difference. If you want to do everything right while caring for this evergreen plant, just follow our care directions. If you want a Mediterranean feeling on your terrace or balcony, just get oleander. 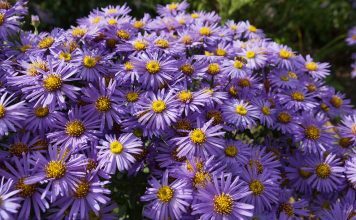 This sun-loving plant will blossom on every occasion and show its differently coloured blossoms. Nerium Oleander is not only available in white, rose, or bright orange tones, but also with filled and unfilled blossoms. 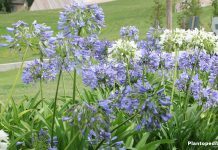 But one thing is really important, when it comes to cultivating oleander: it needs a frost-protected winter habitat, since they are not made for field cultivation in most German regions. The oleander is an evergreen and blossoming bush that can grow up to 3 metres, if you let it grow. The leathery leaves come in a lance-like form and can grow up to 15 cm. The oleander’s blossoms grow in clusters, while single blossoms are three to five centimetres in diameter. 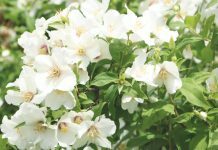 Most blossoms are available in white, different rose colours, or reds and they can appear throughout the whole year, or in colder regions starting in May. 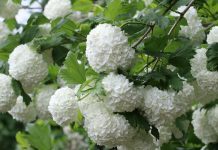 By now, you can not only get the original kinds with unfilled blossoms, but also hybrids with filled ones. 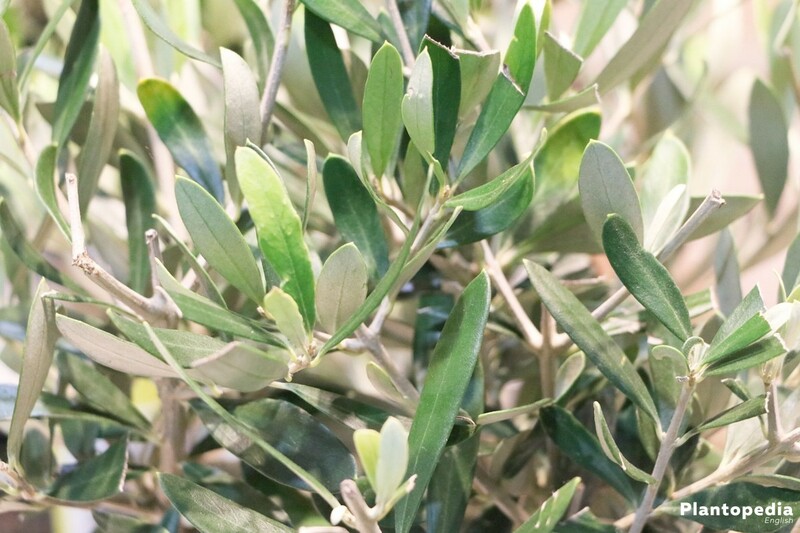 If you put it into an ideal location, this Mediterranean bush can be quite resilient and needs no further care apart from a lot of water and nutrients. 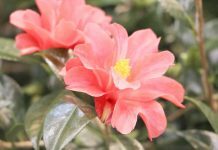 The oleander is a real sun plant that will blossom all year with enough sun and warmth. The ideal location is on a south or southwest aligned wall, where the plant is also protected against wind and rain. During the colder night hours, the heated wall can provide warmth. 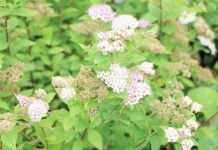 If you place the plant on the eastern side of your house, the blossoms will develop much slower, northern sides should not be used. Free-standing locations in bright sunlight are possible, but the oleander has to deal with rain or wind, which will really damage kinds with filled blossoms. Oleander comes with high demands regarding the substrate. In the outdoors the plants grow at the courses of rivers, partly on stony and submerged soils. These soils are often chalky and tightly compressed. 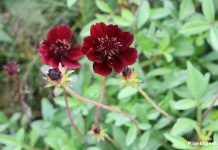 Normal soil, which usually contains turf, is therefore not suitable for cultivation. If you have a warm climate you can plant oleander in your garden during the spring. 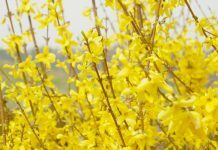 Since most plants’ winter hardiness is not enough in our realms, they can only be planted and exist outside in viticultural areas during the colder months. 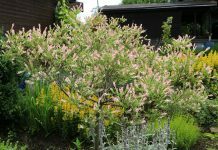 For this purpose you should only choose kinds that are more frost-resistant and have unfilled blossoms. If you want to plant your oleander plant outside, you have to prepare your garden’s soil beforehand. Only the fewest soils are naturally made to act as a substrate. If you look for evergreen oleander in nature, you will see that it mostly grows in the flooded areas of riparian zones, which are nutrient-rich and condensed. 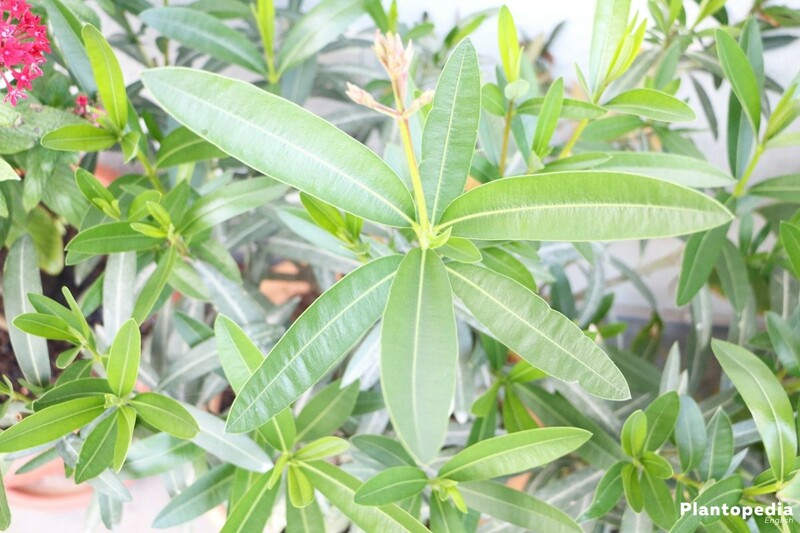 Since we arrived in the day and age of mass production, the sad truth is that most in store oleander consists of more than 10 cuttings in a pot. That might be quite attractive at first glance, but will be unfavourable in the long term, especially when it comes to trimming. 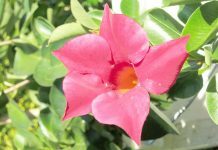 If you want to keep your oleander for many years, you should choose a plant that has been grown from one single cutting. 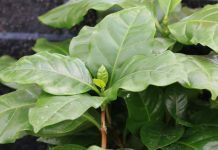 Those plants are usually a bit more expensive and might look smaller, but their already woody basis is more resilient and the plant is much easier to grow. The best time for repotting comes in the spring, when wintered plants are cleaned out and prepared for the new vegetation period. Young plants should be repotted yearly, older oleander plants as required. The new planting vessel should be only a bit bigger than the old one. If you have reached the maximum pot size, you should only apply cautious root trimming. To do this, take the Oleander out of its pot and trimm a root layer on the side and under the bulb. After that, put the plant back into the pot with a bit of fresh substrate, the pot has to be thoroughly cleaned before that. We also advise you to trim the shoots while you’re at it. The water requirements follow sun exposure and temperature. If the oleander is in its colder winter quarters, it doesn’t need as much water. It suffices to check the bulb once a week. 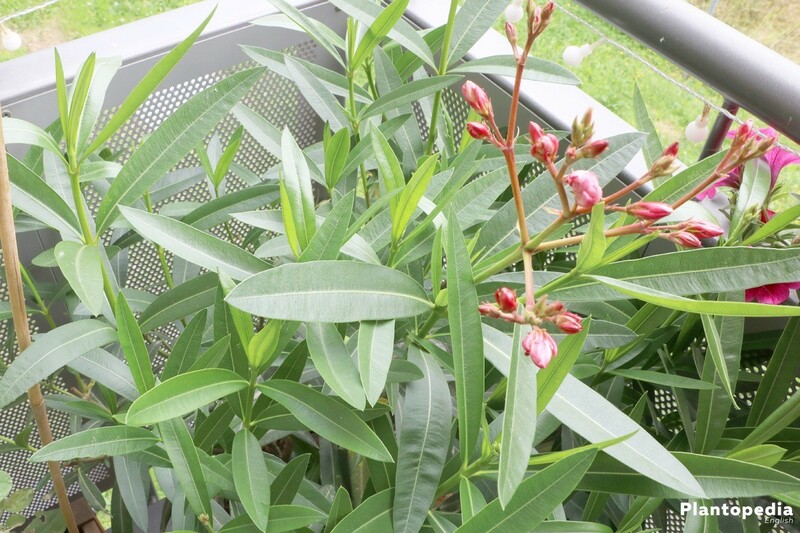 Oleander will also tolerate moisture in its winter quarter for a short time, but we advise you to keep it drier. Once temperatures rise during the spring, water requirements rise, too. If you have your plant on your terrace or balcony, we advise to equip them with a saucer, so that rinsed nutrients and water can be absorbed again. During hot periods the oleander should also be, additionally to the regular watering, watered into its saucer, so that the plant is constantly in water. Big plants have to sometimes be watered up to three times a day. To keep the soil permanently alkaline, the plant cannot be watered with rainwater, but prefers chalky, stale tap water. Always use warmed water and not ice-cold water (directly from the tap) since the evergreen oleander will not tolerate it. The oleander belongs to the heavy feeders. 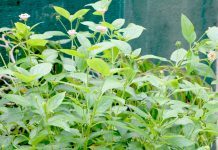 This means that it needs a lot of nutrients and a lot of fertiliser during its growth period. After cleaning out in the spring, you should start fertilising. After the end of August, you should stop fertilising, since the young shoots should be able to mature before the winter arrives. 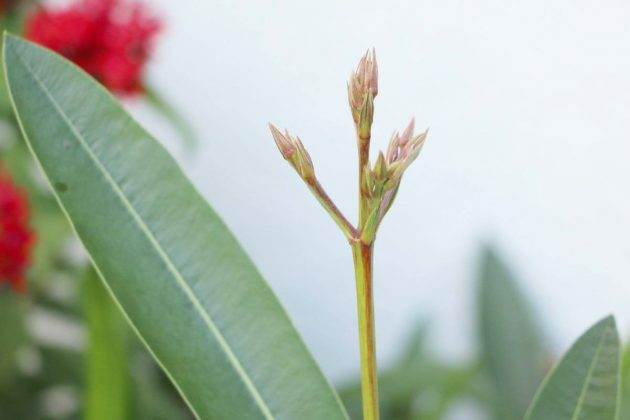 If you have fertilised too much, don’t be afraid, oleander deals with this a lot better than other blossoming plants, only the leaves can grow brown from the outside. If that’s the case, you have to wash out the excessive nutrients from the root ball with a lot of water. 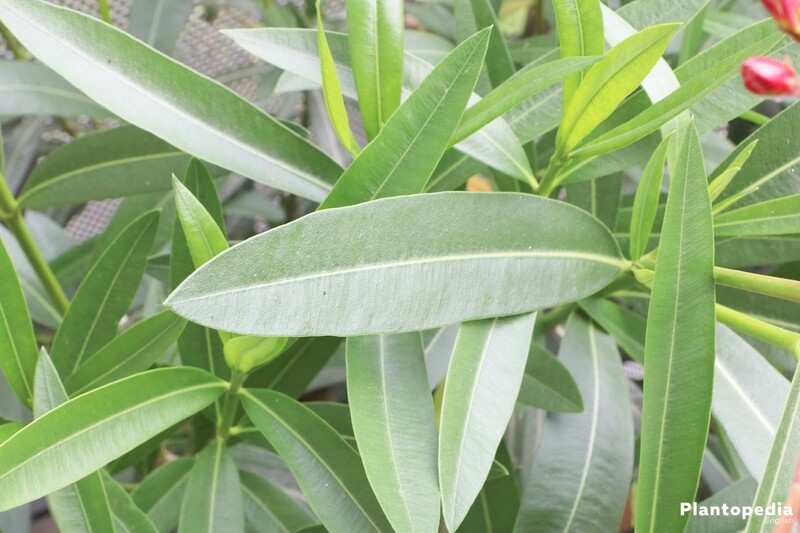 If you want to successfully cultivate your oleander over many years, you cannot go without a trimming from time to time. But remember, this Mediterranean bush should only be trimmed cautiously. We recommend spring time. Since the plant’s roots are active during the whole year, trimming them during autumn would evoke another budding. While trimming Oleander keep this in mind: if you cut into old wood, ne and long shoots will occur. If you cut into blossom regions, you will get shorter shoots that will bloom quickly. You have to find a good ratio. Pot plants need a cool but bright location during the winter. The brighter the oleander overwinters, the more blossoms can be created. 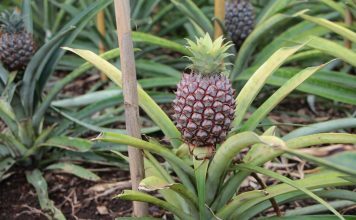 Before putting the plant into its winter location, you should check for pests and, if necessary, treat the plants. Let you plants be outside as long as possible, most plants can tolerate a bit of frost. 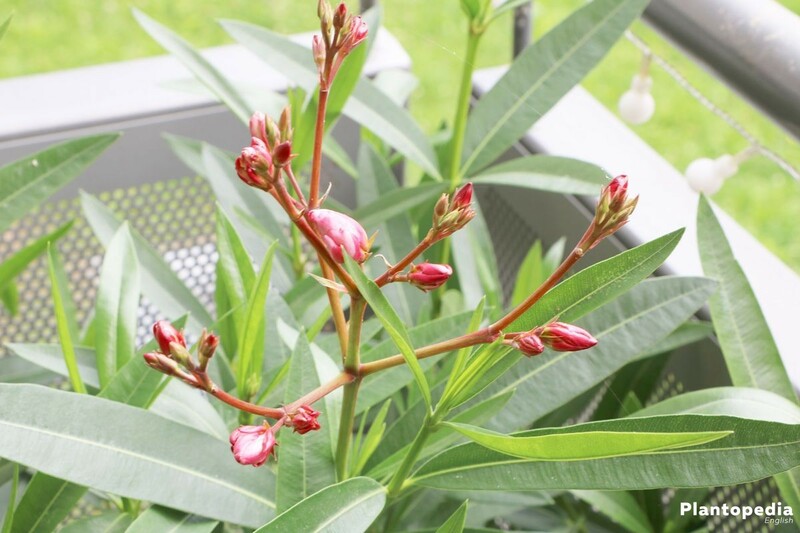 To keep oleander in a warm room during winter is not the greatest thing, since even the brightest place inside the house will not suffice and the plant will create long and thing shoots (etiolated). These shoots will take too much from the plant and they will also not be able to survive outside. If you have a conservatory, or greenhouse, you can keep the oleander warmer starting in March and water it generously. All other pot plants have to get gradually used to outside light and temperature starting at the end of April. Nerium oleander can be bred with cuttings, or seeds. The oleander’s cuttings are quite easily take root. To do this, cut of a few fresh shoot tips during the spring or early summer and put them into a pot filled with soil. 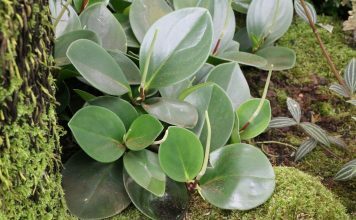 After approximately four weeks new shoots or leaves show themselves and make clear that the cutting has created roots. It can now be put into the same substrate as grown plants. After the cutting has reached a height of ca. 20 cm, the shoot can be shortened to two to three nodes, to encourage branching. 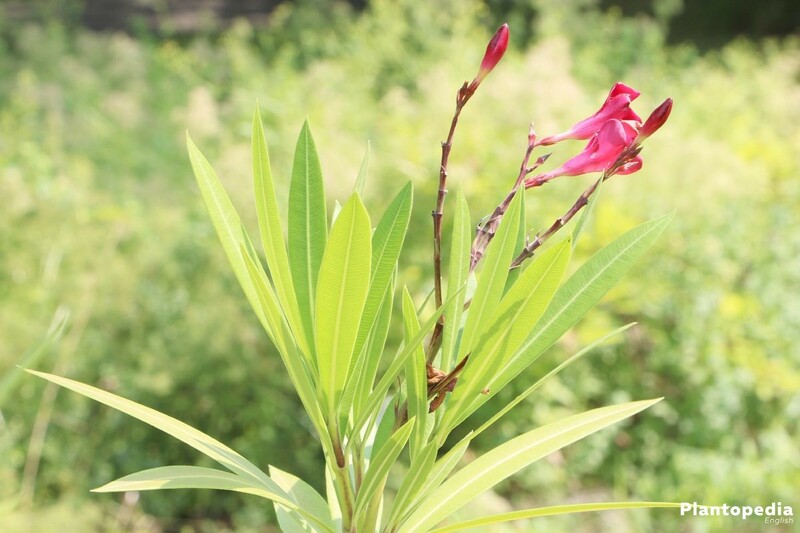 It is possible to breed oleander by seeding, but these plants mostly only bloom after a few years. If you do this, you will have to be really patient until the plant has reached a presentable height. 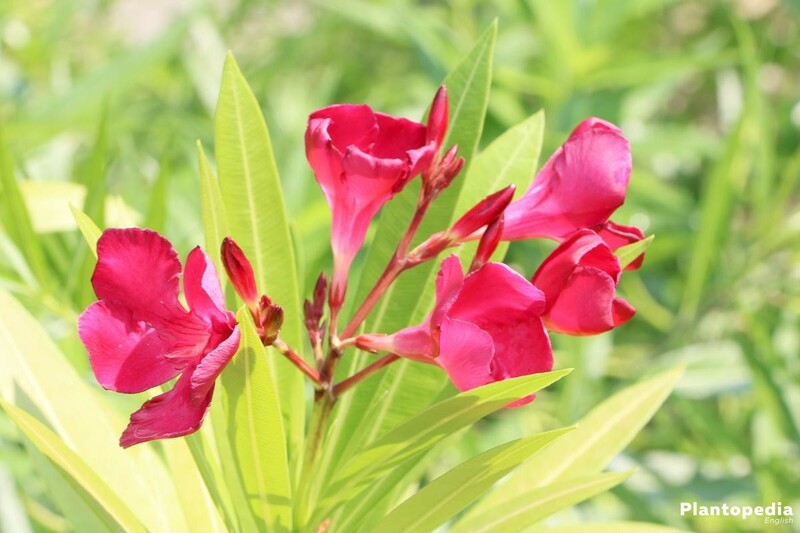 Even if you keep your oleander in great condition, it can become diseased. The most common cause for that are care mistakes. During hot days a sudden falling of leaves can occur. 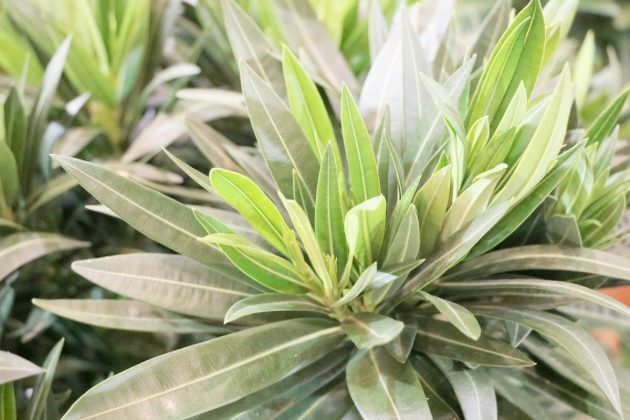 In most cases, this is normal, since an oleander leaf only ages up to approximately 2 years and the plant doesn’t mandatorily lose its leaves during the winter. Another cause can be water deficiency. Check the root ball, if it’s good dry that’s the cause. If the leaves grow brown from the outside and become dry, this can indicate a sunburn, or too much fertiliser. These damages cannot be repaired, but they also won’t really damage your oleander. That’s why you should keep sun protection in mind, especially during the spring. Overly fertilised substrate has to be flushed with a lot of warm water. 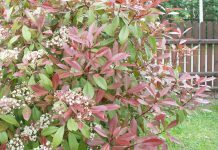 If leaves colour themselves in a pale green or if the leaf-veins can easily be seen since they are too dark, an iron deficiency can be the cause. The most common cause is not lacking fertiliser, but a wrong ph-Value inside the ground. In this case fresh soil and fertilising chalk will help. 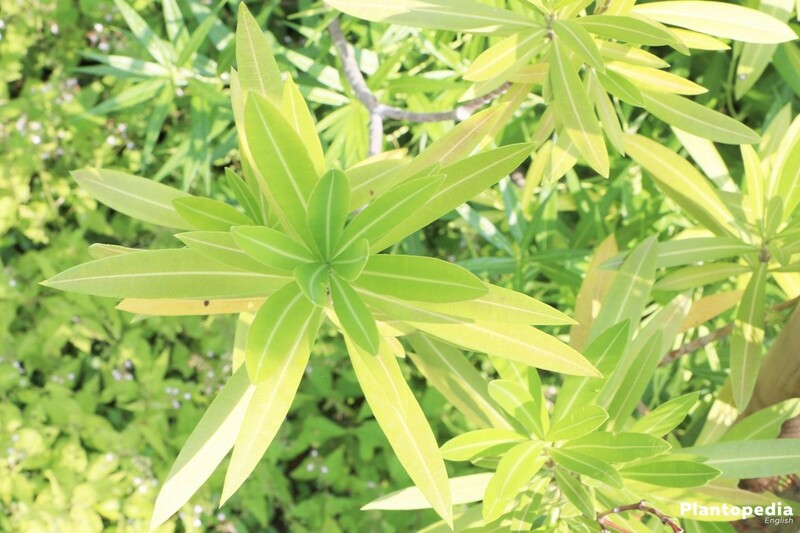 To keep oleander healthy, you will have to carry out some steps during its lifetime. The biggest problem in this case is a winter quarter that’s too warm. 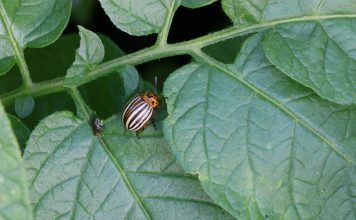 If that’s the case, an infestation with sucking insects like mites or scale insects is inevitable. Oleander is especially prone to spider mates, if it’s in a location that’s too warm or without good ventilation. 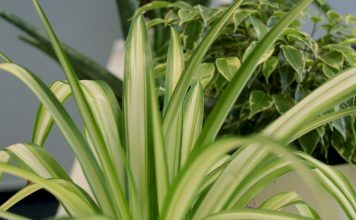 The plant should therefore be checked regularly during the year, especially before taking it to its winter quarter and during the colder months. A great remedy is a repeated spraying with a mixture of rapeseed oil, soap and water. By doing that you have to focus on the underside of the leaf as well.